i notice no gail anne dorsey on the list. that's a pretty large missing piece. Just bought a ticket for Amsterdam. Thanks for the tip. See you in Paradiso ..
Great show in Shepherds Bush, London, last night. If you get a chance to see them on tour, do it! Thanks for the review. I am going in February. Here's a story from Le Figaro previewing the show tonight in Paris (which now has already happened) en français, pour les gens qui peuvent le lire. The author states that Earl Slick takes his stage presence ("allure") from Keith Richards and notes that mike garson recruited Bernard Fowler "choiriste de longue date pour les Rolling Stones." 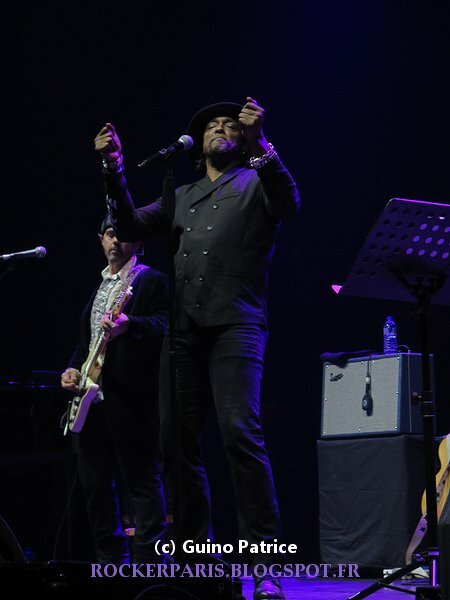 Very good show in Paris with Bernard Fowler taking the lead on a few songs: great voice. "Moins de 25 titres à se partager à trois, avec Bernard Sumner ( toujours aussi insipide) ce n'est quand même pas la mer à boire. Enfin passons..."
I think there's a typo there ;-) I also hate it when singers read everything from the prompter, glad I passed. Nice pics! What songs is Bernard doing? does anybody know if 8 pm is the exact time when the show starts? I'd like to attend the show in Zurich, but can't make it exactly by 8 pm. Enjoyed the show in a packed area. 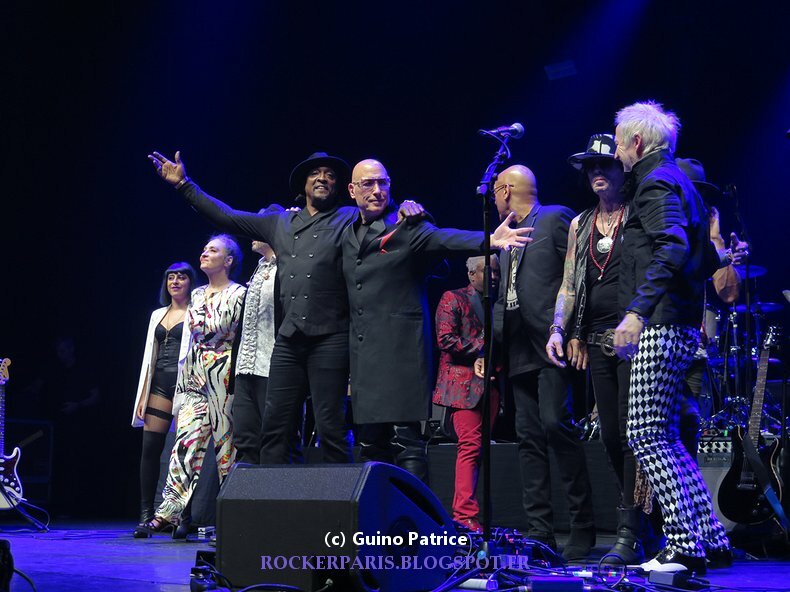 A great Rock N'Roll show performed by extraordinary great musicians leaded by the legendary Mike Garson and Earl Slick - what a f***in great guitarist. Bernard Fowler did a great job as well as Corey Glover, Joe Sumner was disappointing. What a night! What a band!!! Great show!!! Can´t wait to see the band tomorrow in Cologne. Can't wait to see the band this Saturday in Groningen. I'm not sure what songs Bernard does here, but when he plays with Waddy, he'll sing Heroes and Rebel Rebel....both are great versions. During other songs he shared backing vocals and congas (with Corey Glover or Joe Sumner). the show is playing seattle on feb 15. no bernard but charlie sexton is in the band! sadly, i have chemo the day before so i won't be able to go. they tend to frown on people puking in the symphony hall, haha. What a great show yesterday in Cologne. We meet Bernard before the show started in "The Kantine" and we got same signatures. I got one photo with him. First and most important - the best of luck with your treatment crholmstrom. Are you sure about Charlie Sexton? With both Slick and Sexton, this show would be a must see performance. Stay strong man! Thoughts are with you. Sumner was a disgrace. Guy can't sign, has zero charisma on stage and looks like they invited someone over from the insurance office next door to participate in a karaoke event. The rest was pretty awesome, Earl Slick is great! thanks swimtothemoon. i try to make the best of it. i've been battling RA for close to 10 years now. isn't cancer but close enough (RIP Glen Frey). they are giving me meds usually used for leukemia. not pleasant. my bday is monday & i'm heading to vegas tomorrow & am going to see van morrison. van is a bucket list guy for me. i'm sure about slick/sexton. i got email from the symphony about it today.i hadn't heard charlie was playing until that came. wish i could go. just not possible. excited for van though! Edited 1 time(s). Last edit at 2019-01-25 13:25 by crholmstrom. Will anyone of you be there tonight at the show? My review of last night's show : GREAT !!! If you have the chance to see this show don't hesitate (SomeTorontoGirl) and just go ! ...pondering... glad you had fun! my bday is monday & i'm heading to vegas tomorrow & am going to see van morrison. van is a bucket list guy for me. i'm sure about slick/sexton. i got email from the symphony about it today.i hadn't heard charlie was playing until that came. wish i could go. just not possible. excited for van though! Happy Birthday to you and have a fantastic trip! Keep Going and Keep Smiling. Loved the London show BUT all the lead singers, including Bernard were “over singing” the songs and showing off their ranges rather than capturing the mood of each song. That’s the quintessential difference between a Premier League singer/frontperson and a League Championship or League One singer. Watch Bowie live and YouTube and he always knew when to hold back and when to let rip. I will be seeing this show in less than a month in Portland, Oregon. Yes, but she's in Lenny Kravitz's current touring band which I will be much more lucrative given that he is playing Arenas rather than the Bowie alumni band's theatre shows.